Ban hair blahs for good! We rounded up this collection of mid-length celebrity hairstyles to help you keep your curly haircut fresh and modern. Zoe Saldana at the 2011 Teen Choice Awards. Reese Witherspoon at the "Water for Elephants" premiere in Sydney, Australia. MORE: Curly Bobs & Why They Rock! Kelly Ripa at the "Late Show with David Letterman." Winona Ryder at the promotion for "The Dilemma" in Berlin. Heidi Klum at the unveiling of her new signature fragrance, Shine. MORE: Amanda Seyfried’s Advice: Co-wash Your Waves! Katharine McPhee at the 2011 NBC Upfront event. Kendra Wilkinson at the 2009 premiere of "Transformers: Revenge of the Fallen." Salma Hayek at the Alexander McQueen: Savage Beauty Costume Institute Gala at The Metropolitan Museum of Art. 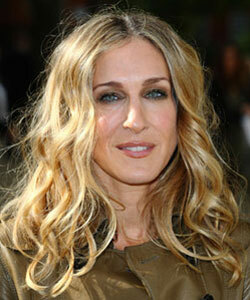 Sarah Jessica Parker at the Burberry show during London Fashion Week. Mary-Kate Olsen at the Burberry show during London Fashion Week. Drew Barrymore at the 2011 Natural Resources Defense Council's Ocean Initiative Benefit. Julia Roberts at the 2011 premiere of "Jesus Henry Christ". Kristin Cavallari at the Comedy Central Roast of Charlie Sheen. Christina Applegate at the Late Show with David Letterman" in 2010. Vanessa Williams at Syracuse University's School of Visual & Performing Arts Gala & Fashion Show.